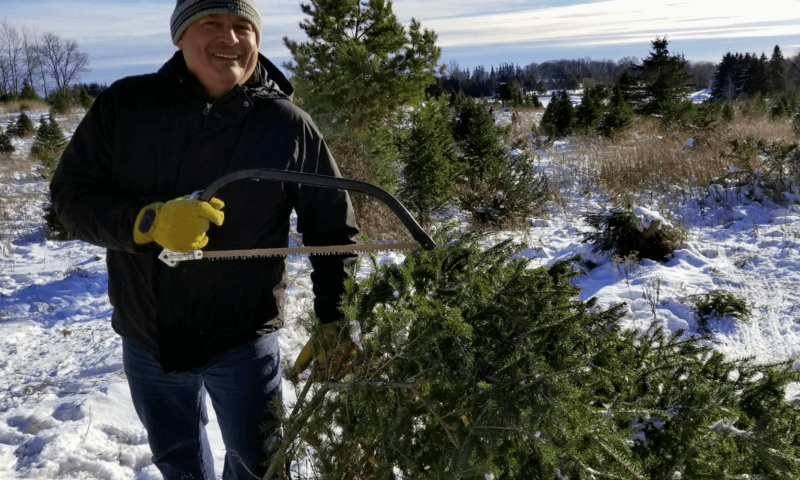 Where To Buy A Christmas Tree in GTA - Travel, Shop, Cook, Have Fun! We don’t like artificial Christmas trees. We had one for some time and mostly because we had a carpet in our living room. Cleaning pine needles from the carpet never sounded attractive to any of us. Once the carpet had been replaced with laminate we started buying real trees for Christmas. And we prefer to select and cut the tree ourselves. Going to the farm to get a Christmas tree became a very important family event, much like having hot chocolate after. You will not necessarily find what you are looking for right away. Always select a few locations to visit. Dress up properly. You will have to walk around in snow or dirt depending on the weather. Don’t forget that it’s getting dark early this time of year. Plan your trip accordingly. You don’t need to bring your own tools, they are usually provided at the farm. Cash only. All the farms we’ve gone to take cash only. Last year, an average tree would cost you $60 – $70. This year, perhaps, the price will be the same or maybe a bit higher. Plus, keep in mind that coffee, hot chocolate and sweets are offered in most locations, so have an extra $20 just in case. And, of course, have a good plan for how you will be bringing your tree home. Tarp and rope may be very handy. Okay, now seems like you are ready. Hopefully, you will enjoy this little adventure as much as we do. Below is a list of farms for different regions of the GTA.